As the final whistle sounded on Sunderland's 2016 FA Cup dreams, Jordan Pickford trudged towards the halfway line to shake hands with opposite number Petr Cech. The Arsenal keeper - who has lifted both the cup and the league title on four separate occasions - took off his shirt and handed it to the 21-year-old as a memento of his debut for his boyhood club. Inevitably, Pickford will have been dreaming of a maiden appearance where he made a string of unfeasible saves and registered a clean sheet in an unlikely cup upset for the much-changed Black Cats. But in reality, the England Under-21 international's bow in red and white went as well as he could have hoped, with little he could do about any of the goals. Pickford denied Kieran Gibbs, Theo Walcott, the impressive Joel Campbell and Olivier Giroud with smart stops, while demonstrating the range of pinpoint distribution which was has so caught the eye at U21 level and during his various loan spells. Crucially - with the sound of the away end chanting "Jordan Pickford, he's one of our own" ringing in his ears throughout - the boyhood Sunderland fan didn't look out of his place at this level, either with his keeping or his mental approach to the game. In a cup game where there was little to lose for Allardyce other than fresh injuries, Pickford's display will have come as a big boost for the Sunderland boss and perhaps gives him a decision to make ahead of Wednesday's crucial clash against fellow strugglers Swansea. The other plus point was the performance of Jeremain Lens, for the first half at least, as the unsettled Dutch international opened the scoring and caused problems from a 'number 10' role. It suited Lens to be used in that fashion with fewer defensive responsibilities, even though he notably tracked back on a couple of occasions before the break. That is food for thought for Allardyce at Swansea. The trip to the Liberty Stadium was clearly on Allardyce's mind, with Lee Cattermole and John O'Shea both withdrawn before the midway point of the second half to preserve their legs. Without those two leaders on the field, Sunderland's defensive resilience disintegrated in the final 20 minutes, with the makeshift left-sided combination of Patrick van Aanholt and Danny Graham unable to halt the rampaging runs of Hector Bellerin down the flank. There was no resistance to the Gunners, as the cup holders went up a gear to avoid the replay which every Premier League side dreads at this competition. 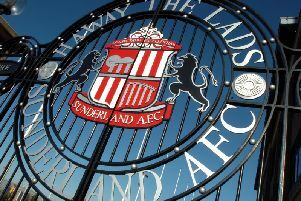 But as Sunderland joined three other North East sides in being eliminated at the third round stage, it is that clash in south Wales which is now the Black Cats' cup final.